This June be the lucky winner of a Chocolate Gift Package stuffed to the brim courtesy of Hagensborg Chocolates! Not only are these chocolates delicious, we love the packaging and the story behind the idea of pigs to represent the Hagensborg chocolate line. At Hagensborg, we believe in the magic of chocolate. We believe we are sweetening the world by making an emotional connection with everyone who enjoys our products. Hagensborg is committed to inviting all to be part of the fairytale of life, through childlike simplicity, playfulness, quality, authenticity, warmth and love. If I only had a dollar for every time somebody asked me why we put “PIGS” on our chocolate bars I would be a very wealthy lady! The truth of the matter is quite simple. We produce high quality All Natural European chocolate truffles. 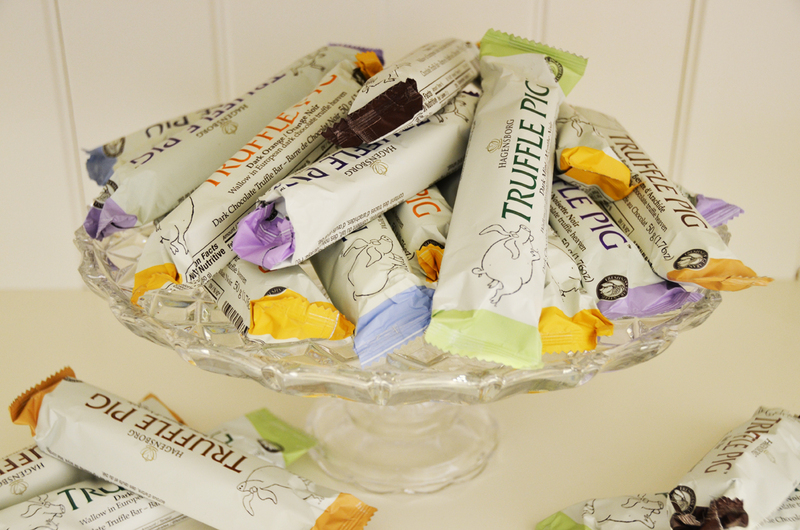 When we decided to create a chocolate bar we researched where the word truffle originated from and learned everything there is to know about the subject. What we learned is that truffles are a rare mushroom found in the forest, also called the diamond of the kitchen. To find these unique delicacies pigs were used because they have an innate ability to sniff out these exotic treats. Understanding that chocolate truffles and truffles have nothing in common we decided to bring these two ideas together, thus creating “The Truffle Pig”. Need some chocolate accents for your wedding? Include local handmade Parisian bon bons that will delight your guests. Package them in these colorful 2 piece boxes that will accent any table perfectly! Select your choice of chocolate flavor as well as your ribbon color to match your wedding theme. You can also customize your ribbon with the Bride & Groom's names or any romantic message that you want to share. And if you are a looking for that perfect late night snack...why not include a midnight chocolate buffet featuring all things chocolate...the sugar rush is bound to keep your party going! If anything, you must check out Hagensborg's gift boxes...the packaging alone will bring a smile to any person you wish to bestow a gift upon (i.e. your bridesmaids or mother-in-law). Something we learned while researching for this post is that just like a wine connoisseur can taste the wines of varied regions, Chocolate is assessed in this same way and referred to as Single origin Chocolates. Hagensborg's cute truffle pig mascot combined with these chocolate bars’ jungle origins inspired the Wild Boar name, and three voracious cartoon boars adorn the colorful packaging. These pure chocolates allow more subtle tastes to come through, such as fruit and creaminess in the Ecuador bar, acidity and red fruits in the Madagascar and strong cocoa in the Santo Domingo. To check out all of Hagensborg's Chocolate Bars & Bites...visit their website or Follow them on Facebook or Twitter: @trufflepigbar. 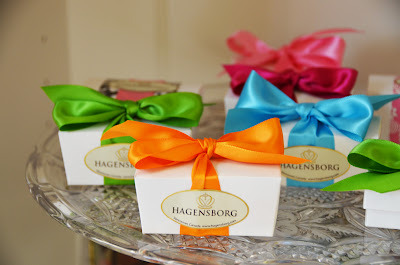 WIN a Hagensborg Chocolate Gift Package stuffed with chocolate! 2 piece assorted handmade Parisian bon bons. Great for wedding favors! 7 piece assorted handmade Parisian bon bons. Great for wedding thank you gifts! Value of this package is $80.00 CAD. This Contest ends Saturday, June 30th, 2012 at midnight PST. Winner will be drawn randomly and announced on the DreamGroup Blog, Facebook and Twitter on July 1st. The winner must contact DreamGroup within 72 hours to claim their prize, otherwise another winner will be drawn. 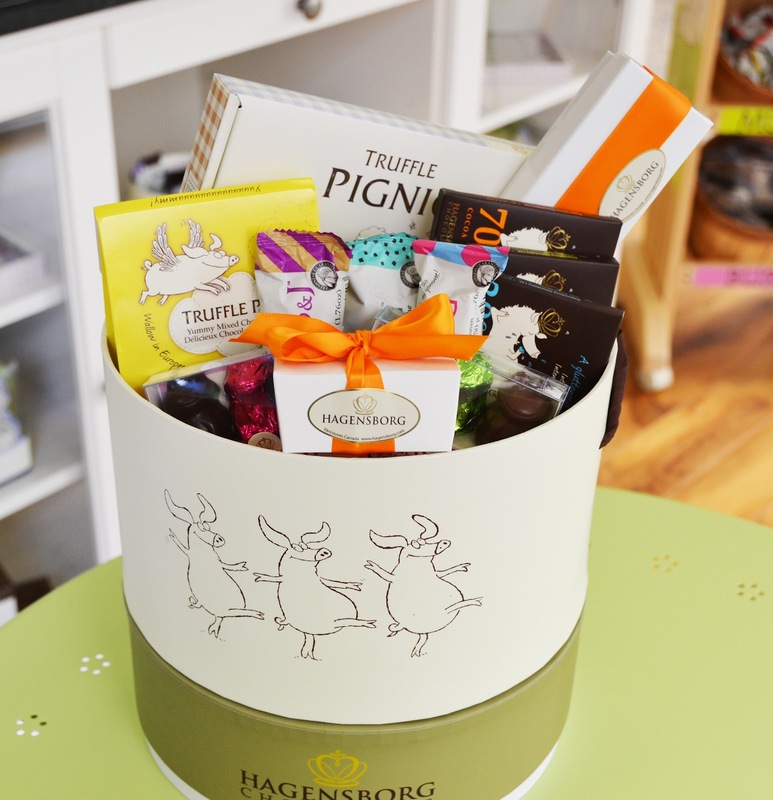 "I entered @DreamGroup's Giveaway for a Hagensborg Gift Package stuffed with chocolate @trufflepigbar "